Domain of Tanaros: Caine Black Knife and Caine’s Law – the Final Chapter? Caine Black Knife and Caine’s Law – the Final Chapter? I have finished reading these two books a while ago but I needed some time to think about them before writing this review, not to mention being firmly clamped in the jaws of everyday life. The reason why I decided to write about both of them is the fact that they can be easily perceived as one novel divided into two parts. 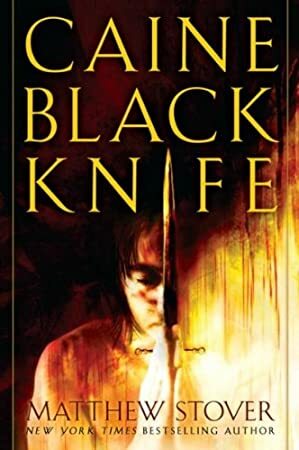 In Caine Black Knife, Caine returns to the place where he had the adventure that made him a star (Retreat from the Boedecken). He remembers the events that took place twenty five years ago, and at the same time a new plotline is developing, which promises, as always when Caine is involved, huge turbulences. Again, we are treated with interesting notions about myths and archetypes, interesting new characters such as the Horse Witch, and plenty of action. The book ends with a cliffhanger, which slightly diminishes the value of this book as a stand alone novel, but adds to it as a first half of a larger whole. That brings us to the second book. In Caine’s Law, the things take an interesting turn. Caine has been taken back to the our world and forced to become one with his nemesis from Blade of Tyshalle, the Blind God personified by black oily substance. At this point the plot becomes slightly difficult to follow. Stover ambitiously grants his titular character the ability to travel through time. As I perceived it, to Caine, the entire history becomes like a book of myth and reality so closely interlaced that they are indistinguishable from each other. He was capable of opening any page and appear when and where he wanted. He was allowed to change one thing, and that one thing would change everything. Caine takes us to different points in time and brings in a number of characters to help him. At times, it is not quite clear what takes place and, more importantly when, but it is always interesting. There are no boring parts, and everything eventually falls into place in a very satisfactory ending. I enjoyed both books immensely. The first one reads as an adventure novel with two parallel story lines, adroitly amalgamated into one, with lots of action and straightforward plotting. The second one is a more demanding read but more rewarding as well. Stover likes to intertwine philosophical questions and literary references with thrilling action and sometimes even graphic imagery. The question mark in the title of this entry means that it is still not known if we would have the chance to read more about Caine. In his interview to John Scalzi, Mr. Stover said that, should there be, after the publishing of Acts of Caine in UK, "a world-wide clamor for more stories about a certain charismatic homicidal sociopath with serious anger issues . . . well, I’m ready for that too." So, Mr. Stover, consider this blog entry another voice in that clamor, and give our hero another adventure. He will be pissed as hell, and he will love it! In the end, if I had to grade these two books, they are both deserving of highest grades. As for the entire series, I think it belongs up there with Song of Ice and Fire, as one of the best, unjustly underrated, pieces of literature in the genre.